Bahiyyih Nakhjavani is a Persian writer who grew up in Uganda and was educated in the United Kingdom and the United States. She now lives in France where she teaches. She taught European and American literature in Belgium. 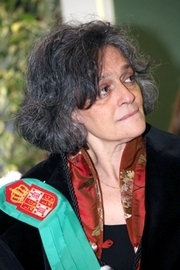 In 2007, Bahiyyih Nakhjavani received the honorary doctorate Doctorats Honoris Causa from the University of Liège. Her books have been translated into many languages. Bahiyyih Nakhjavani is currently considered a "single author." If one or more works are by a distinct, homonymous authors, go ahead and split the author. Bahiyyih Nakhjavani is composed of 6 names. You can examine and separate out names.